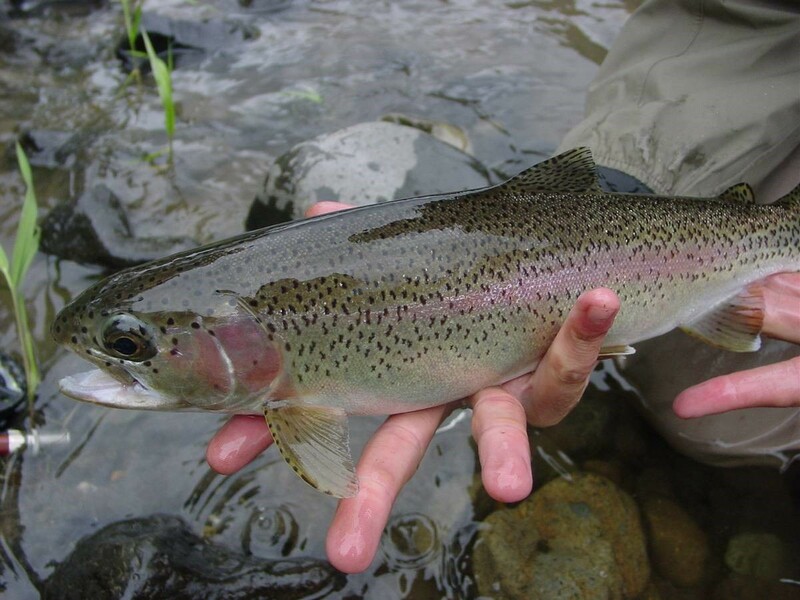 (18/P087) TRENTON – The New Jersey Department of Environmental Protection’s Division of Fish and Wildlife is kicking off the fall trout season today by stocking rivers, streams, lakes and ponds across the state with thousands of large rainbow trout. More than 21,000 two-year-old rainbow trout, ranging from 14 inches up to 18 inches in length and weighing 1 1/2 pounds, along with some three-year old broodstock (averaging around four pounds each) will be stocked in 16 rivers and streams, and 21 ponds and lakes throughout the state. The trout are raised at the Pequest State Trout Hatchery in Warren County. On Saturday, Oct. 20, anglers of all ages and skill levels can try freshwater fishing without having to purchase a fishing license during the second Free Fishing Day of the year. The first was during spring. The 16 large streams and rivers in northern and coastal New Jersey, such as the Big Flatbrook, Pequest River, South Branch Raritan River, Musconetcong River, and the Manasquan and Toms rivers are stocked during the first week of fall stocking. During the second week, 21 ponds and lakes across the state will be stocked. Many of the rivers to be stocked also have fish that were released previously, providing even more opportunities to catch bigger fish. Waters may be fished at any time. During the Free Fishing Day, residents and non-residents can fish without paying for a license or trout stamp. Other regulations, including size and daily catch limits, will remain in effect. Free Fishing Days provide an opportunity to fish for a wide variety of fish including trout, largemouth and smallmouth bass, pickerel and numerous panfish species. Muskellunge, walleye, northern pike, channel catfish, and hybrid striped bass fisheries also will be thriving. For a complete list of trout-stocked waters, the stocking schedule, regulations, fishing access points and trout fishing facts, visit www.njfishandwildlife.com/trtinfo_fall.htm. Stocking updates will be posted as needed. 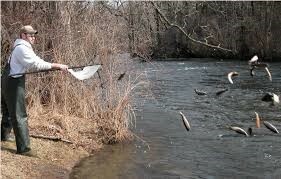 Stocking information also is available by calling the Trout Stocking Hotline at (609) 633-6765. Anglers may also download the stocking schedule to their cell phones by scanning the QR Code that appears in the 2018 Freshwater Fishing Digest or on the Division of Fish and Wildlife's trout stocking signs posted along trout-stocked waters. Except for Free Fishing Days, anyone age 16 or older must obtain a fishing license to fish the fresh waters of the state. A trout stamp is also required to fish for trout. Children under 16 and New Jersey residents 70 years and older may fish without a license. Licenses and stamps may be obtained through license agents statewide, found at www.njfishandwildlife.com/agentlst.htm. They can also be purchased at www.nj.wildlifelicense.com. Anglers who have yet to purchase their 2018 fishing license can introduce a friend or family member to fishing at a reduced price by purchasing a “Fishing Buddy” license. These discounted licenses are available to resident anglers ages 16 to 65, or any nonresident angler over age 16 who purchases an annual New Jersey freshwater fishing license at the same time as their buddy. For more about the Fishing Buddy license, visit www.njfishandwildlife.com/fishbuddy.htm. Follow the Division of Fish and Wildlife on Instagram @newjerseyfishandwildlife.